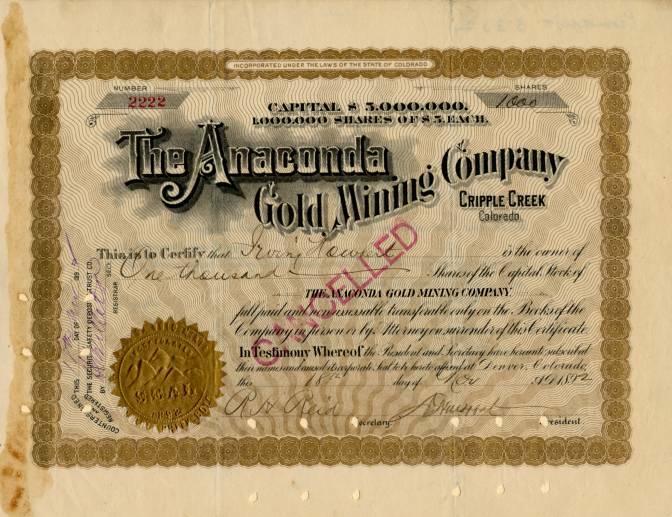 Beautiful certificate from the Anaconda Gold Mining Company issued in 1892. This historic document has an ornate border around it with a vignette of the company name. This item has the original signatures of the Company's President, David Halliday Moffat and Secretary, and is over 123 years old. Punch cancelled with clean signature. David Halliday Moffat (July 22, 1839 � March 18, 1911) was an American financier and industrialist. Moffat was one of Denver's most important financiers and industrialists in late 19th and early 20th century Colorado, and he was responsible for the development of the Middle Park area. He served as president, treasurer and as a board member of railroads, banks and city government posts. Over the years he had claims to over one hundred Colorado mines and nine railroads. Moffat died on March 18, 1911 in New York City at the age of seventy three. Some had said[who?] that he had vainly spent fourteen million dollars on the dream of a railroad directly west from Denver. The Denver and Salt Lake Railway had cost him $75,000 a mile, and Rollins Pass had cost him the rest of his fortune. He was in New York city trying to raise more money, and was stopped by what would later be learned was the doing of E. H. Harriman and George Jay Gould I. He was one of the greatest threats they had faced in years. Although Moffat was looked at[who?] the time as a vain dreamer, he would later be viewed by many as ahead of his time. His legacy would leave Denver and Rio Grande Western Railroad and later Union Pacific Railroad with a railroad that would outlast most other rail lines in Colorado. He would have Moffat Tunnel and Moffat County, Colorado named after him. 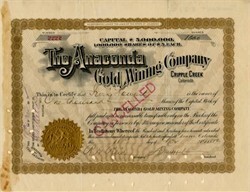 The Anaconda Gold Mining Company. Main Office�827 Exchange building, Denver, Colorado. In treasury January 1, 1900, 15,000 shares; in treasury January 1, 1900, $505.30 cash. Owns the Lone Star, Lone Star No. 2, Lone Star No. 3, Rustler, Property Puffer, Anaconda, Grover Cleveland, Superior, Excelsior, Great View. Hub, Little Mack, Free Milling, Sarah B., Napoleon, Kittle M., No Name, Oro Pino and Ivy Wild, containing 150 acres, in the N. W. 1-4 of section 19, on Gold hill. Patented. The equipment on the property is complete. This company reports Development on January 1, 1900, that there is opened up on this property 31,483 feet of tunnels, drifts and winzes; in its last report it claims ore sales during 1899 of 9,325.58 tons of mill ore of average net value of $7.35 per ton, making $58,598.33, and 21.37 tons smelter ore, average value $112.86, making $2,411.00, or total of $71,010.24. Highest price for stock during 1899, 59 cents; lowest price for stock during 1899, 43 cents. In May, 1900, an effort was made to voluntarily assess every stockholder at the rate of 15 cents per share to liquidate an indebtedness on the property of about $112,000, and to provide funds for further operations. The stockholders failed to respond, and as this Manual goes to press (June) a reorganization is being perfected by Mr. J. T. Milliken and associates, who have assumed the liabilities.